1.Preheat oven to 400°. Cut off and discard about 1/2 inch from top of garlic to expose tips of most cloves. In small bowl, combine rosemary, 1 tablespoon oil, salt and pepper. Place beef, fat side up, in small roasting pan. Rub beef all over with oil mixture. Place garlic, cut side up, in corner of roasting pan next to beef. Drizzle remaining 1 teaspoon oil over garlic. Pour 3/4 cup broth into bottom of pan; set aside remaining broth to use later. 3.Meanwhile, when cool enough to handle, squeeze out pulp from garlic head into pan drippings. Lightly mash garlic with fork. Add wine to drippings and cook over medium heat 5 minutes. Mix cornstarch with remaining 1 cup broth; add to pan and heat to boiling. Boil 1 minute or until sauce thickens. Remove pan from heat. Stir in butter. 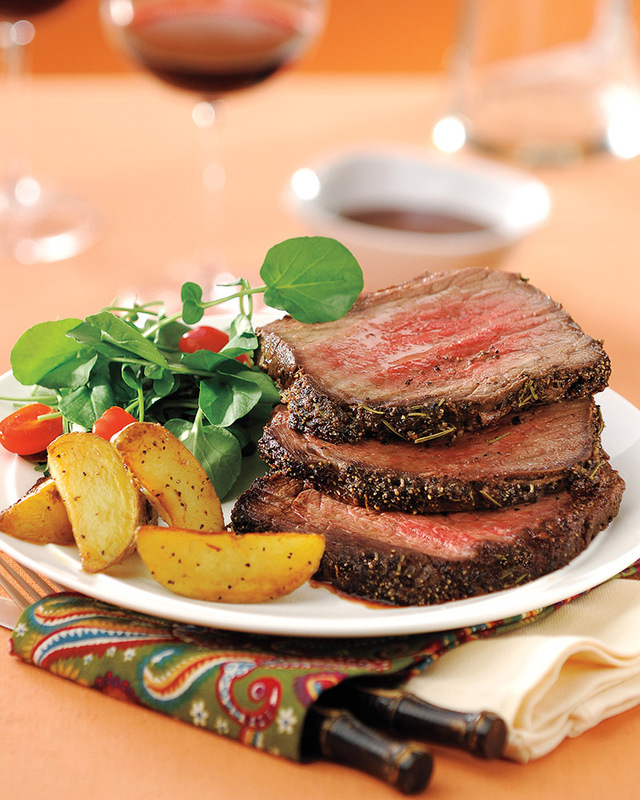 Slice beef across the grain; serve with sauce.